Easy-moving comfort for physical training. 5 pairs, 1 low price! As seen worn by Hungarian troops during physical training exercises. "MH" on each Sock stands for "Magyar Honvédség", the national military of Hungary which includes both ground and air forces. These are fresh new Socks, moisture-wicking for high activity. More durable than the socks from retail stores, offered here for way less. 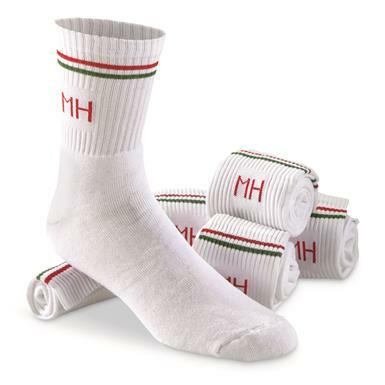 Hungarian Military Surplus Cotton Sport Socks, 5 Pairs, New is rated 4.3 out of 5 by 3. Rated 5 out of 5 by shilohlee from beats fruit of the loom hands down i bought my first pack few weeks ago and was impressed. I have since ordered couple more packs. They are soft and pretty durable as i can see so far. Rated 3 out of 5 by Tahoebusman from They shrink brilliantly! I have a tough time finding calf length sport socks. Tried these, one pair at a time.First pair, they fit fine though they were obviously a thin material. They were eventually washed, warm/cold cycle and low/medium heat dry. They now look like socks for a size 9 shoe. I was able to pull the socks onto my feet but they are now a calf-length sock. Great, if you are looking for disposable socks. Rated 5 out of 5 by cukidio from Excellent Quality and Great Price 97 percent cotton socks, feel great , cushioned heel and toe.